After the meeting most of the guests including Nivedita concluded that what they heard was nothing new. All these things had been said before. Later on Nivedita could not help revising her opinion. She said, “For my own part, however, as I went about the tasks of that week, it dawned on me slowly that it was not only ungenerous, it was also unjust, to dismiss in such fashion the message of a new mind and a strange culture. It occurred to me that though each separate dictum might find its echo or its fellow amongst things already heard or already thought, yet it had never before fallen to my lot to meet with a thinker who in one short hour had been able to express all that I had hitherto regarded as highest and best.” (2) From then on she took every opportunity that came her way, to listen to Vivekananda lecture whenever he was in London. Nivedita came to India in January of 1898. A few weeks later a small group of Swami Vivekananda’s disciples from America arrived. 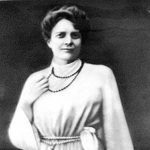 Nivedita and this group of western disciples together began “the study of India, and something also of the home aspects and relationships of the Swami’s own life”. Then in the summer of 1898 Swami Vivekananda took them, along with a few of his Indian brother disciples, on a tour of northern India. Up until this time Nivedita was skeptical of Swami Vivekananda’s philosophy even though she had accepted him as her “master”. She said, “My relation to our Master at this time can only be described as one of clash and conflict. I can see now how much there was to learn, and how short was the time for learning to be, and the first of lessons doubtless is the destroying of self-sufficiency in the mind of the taught.” (5) So, it was on this trip that Swami Vivekananda’s training began of “his most rebellious disciple”. He constantly rebuked her and attacked her thinking and line of reasoning which were her most cherished possessions. She said, “Suffering is often illogical, and I cannot attempt to justify by reason the degree of unhappiness which I experienced at this time, as I saw the dream of a friendly and beloved leader falling away from me, and the picture of one who would be at least indifferent, and possibly, silently hostile, substituting itself instead.” (6) Even though she was not prepared for this kind of treatment yet she did not retract her own proffered service to the master. 1)	The Master as I saw him, Pg. 6, Nivedita, Longman’s, Green and Co., London, 1910. 2)	The Master as I saw him, Pg. 13, Nivedita, Longman’s, Green and Co., London, 1910. 3)	The Master as I saw him, Pg. 15, Nivedita, Longman’s, Green and Co., London, 1910. 4)	The Master as I saw him, Pg. 16, Nivedita, Longman’s, Green and Co., London, 1910. 5)	The Master as I saw him, Pg. 136, Nivedita, Longman’s, Green and Co., London, 1910. 6)	The Master as I saw him, Pg. 137, Nivedita, Longman’s, Green and Co., London, 1910. 7)	The Master as I saw him, Pg. 139, Nivedita, Longman’s, Green and Co., London, 1910.